Background and objectives: Trauma memories lay at the core in etiopathogenesis of post-traumatic stress disorder (PTSD). Using pharmacological and cognitive behavioral treatments that specifically target trauma memories can improve the outcome. Ketamine has been shown to rapidly improve symptoms in PTSD and comorbid depression, but unfortunately these effects are short-lived. Trauma Interventions using Mindfulness Based Extinction and Reconsolidation (TIMBER) psychotherapy is a type of mindfulness based cognitive behavioral therapy that targets the trauma memories. TIMBER psychotherapy in combination with (R,S)-ketamine are increasingly used to treat PTSD and comorbid depression. This study aims to determine if the combination of (R,S)-ketamine chemotherapy and TIMBER psychotherapy would produce a positive synergistic response in patients with PTSD. Design: This is a randomized, placebo-controlled, cross-over clinical study. Methods: Because response to ketamine alone is short-lived, this study combined TIMBER with a single infusion of 0.5 mg/kg (R,S)-ketamine to sustain its therapeutic effects. 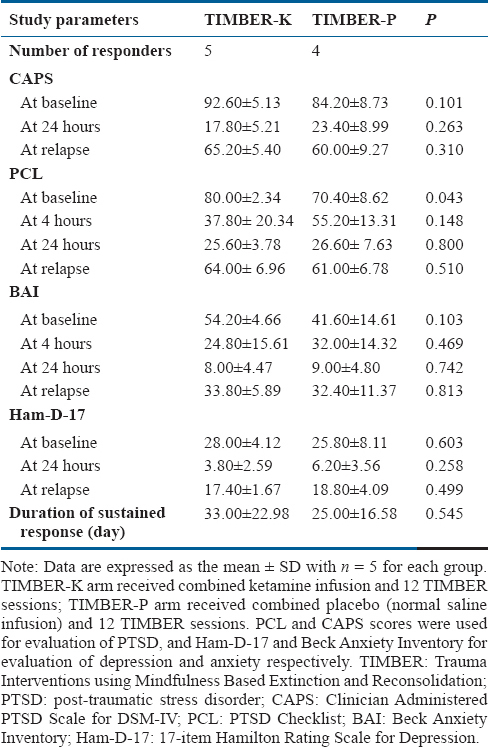 Ten patients with chronic and refractory PTSD were randomly assigned to two groups (n = 5 each): TIMBER-K group patients received ketamine infusion in combination with 12 TIMBER sessions (3 sessions in the first week followed by 9 sessions conducted on a weekly basis) and TIMBER-P group patients received placebo (normal saline infusion) in combination with 12 TIMBER sessions. The patients in the TIMBER-P group were switched to those in the TIMBER-K group after they experienced a sustained relapse. Outcome measures: PTSD Checklist (PCL), Clinician Administered PTSD Scale for DSM-IV (CAPS), the 17-item Hamilton Rating Scale for Depression (Ham-D-17, clinician rated), Beck Anxiety Inventory (BAI), and Montreal Cognitive Assessment (MoCA) at baseline and 8 hours after infusion were used to investigate if ketamine selectively affected trauma memories leaving the general memory intact. The mindfulness interventions in TIMBER were personalized based on subject's scores on Assessment Scale for Mindfulness Interventions which was administered at baseline, and after 5 sessions and 9 sessions (completion) of TIMBER. In this study, scores on CAPS and PCL scales were the primary outcome measures. 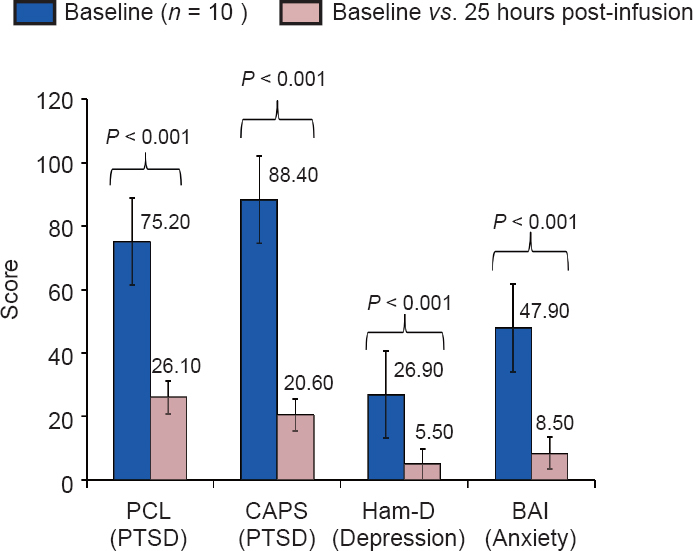 Results: In the acute phase trial ( first 3 months after infusion), nine out of 10 subjects showed robust response in primary outcome measures (PCL and CAPS scores for PTSD) and in the secondary outcome measures (Ham-D-17 and Beck Anxiety Inventory for depression and anxiety respectively) with a sustained response of 31.78 ± 18.29 days. The TIMBER-K group had a more sustained response (33 ± 22.98 days) compared to the TIMBER-P group (25 ± 16.8 days, P = 0.545). After switch from TIMBER-P group to TIMBER-K, patients experienced significantly prolonged response (49 vs. 25 days, P = 0.028). There were no intolerable side effects or dropouts during the 18-month follow-up period. Conclusion: TIMBER psychotherapy augmented with low dose (R,S)-ketamine prolongs the therapeutic effects of the later and may be a valuable treatment option for PTSD. In post-traumatic stress disorder (PTSD), pathologically ingrained trauma memories (TMs) lay at the core of the psychopathologies which influence the formation and maintenance of other major symptoms, such as intrusive thoughts, flashbacks, avoidance, numbing, and hyperarousal. These TMs become ingrained into the brain through conditioned learning mediated by the hippocampus, amygdala, pre-frontal cortex, and basal ganglia along with the brain stem and hypothalamus-pituitary axis (Nader et al., 2000; Shin and Liberzon, 2010; Soeter and Kindt, 2010). In the United States, 3.5% of adults or 7.7 million people have a lifetime risk of developing PTSD (Kessler et al., 2005). PTSD is often chronic and refractory to treatment and over 42% of patients with PTSD receive “minimally adequate care” (Kessler et al., 2005; Hoge et al., 2014). Less than 60% of patients with PTSD respond to frontline antidepressant (SSRIs) therapy and about 20–30% drop out from prolonged exposure therapy (Stein et al., 2006). One explanation for the suboptimal responses to the current treatment strategies is that many of them do not specifically target the TMs. Eye Movement Desensitization and Reprocessing (EMDR) (Shapiro, 1999) is claimed to specifically target TMs but further details about its exact mechanism is largely unknown, and due to its considerable variability in controlled studies on EMDR, it is difficult to make definitive conclusions (MacCluskie, 1998). Only a few psychopharmacological studies using D-cycloserine (Cukor et al., 2009), propranolol (Pitman et al., 2002; Debiec and Ledoux, 2004), and clonidine (Gamache et al., 2012) have addressed the extinction of the sympathetic hyperarousals associated with the TMs; however, none of these studies has examined the effect of a memory specific combined pharmacological and mindfulness based psychotherapy approach. TIMBER (Pradhan, 2014) is a translational and TMs specific mindfulness based cognitive therapy that attempts to close some of the existing treatment gaps for PTSD. In addition to incorporating the mindfulness based tools, TIMBER interventions involve use of many other psychotherapeutic treatments for PTSD, mostly elements of graded exposure and cognitive reprocessing, both of which target and attempt to change the TMs and their expressions in clients' daily life. TIMBER integrates in a self-help and user friendly format, the mindfulness based cognitive behavioral therapy (CBT) with insights gained from cutting edge research of TMs (Westbrook et al., 2002; Hupbach et al., 2007; Monfils et al., 2009; Schiller et al., 2010; Shin and Liberzon, 2010; Pradhan, 2014). In TIMBER, the expressions of TMs are therapeutically altered by use of mindfulness based graded exposure therapy (MB-GET, a type of CBT) (Pradhan et al., 2015, 2016) implemented initially via therapist assisted sessions followed by daily home practice sessions. Of note, memory extinction-only based approaches (as done in many exposure based treatments) temporarily suppress (rather than changing) the expression of existing fear memories and have been clinically used in PTSD and phobic situations. However, reappearance of extinguished memory traces through mechanisms like spontaneous recovery, renewal, reinstatement, and rapid reacquisition leading to insufficient recovery or eventual relapse as seen in many cases of extinction-only approaches (Westbrook et al., 2002; Monfils et al., 2009). In contrast, memory reconsolidation is a newer concept that attempts to modify existing pathological memories resulting in the formation of new memories and, thereby, offering a distinct advantage over extinction. As an integrated and novel approach, TIMBER uses a balanced combination of both extinction (of TMs) and reconsolidation (of calming memories) and capitalizes on the fact that controlled reactivation of TMs makes them labile and thus prone to change (reconsolidation) but does not over-flood or re-traumatize the patient. 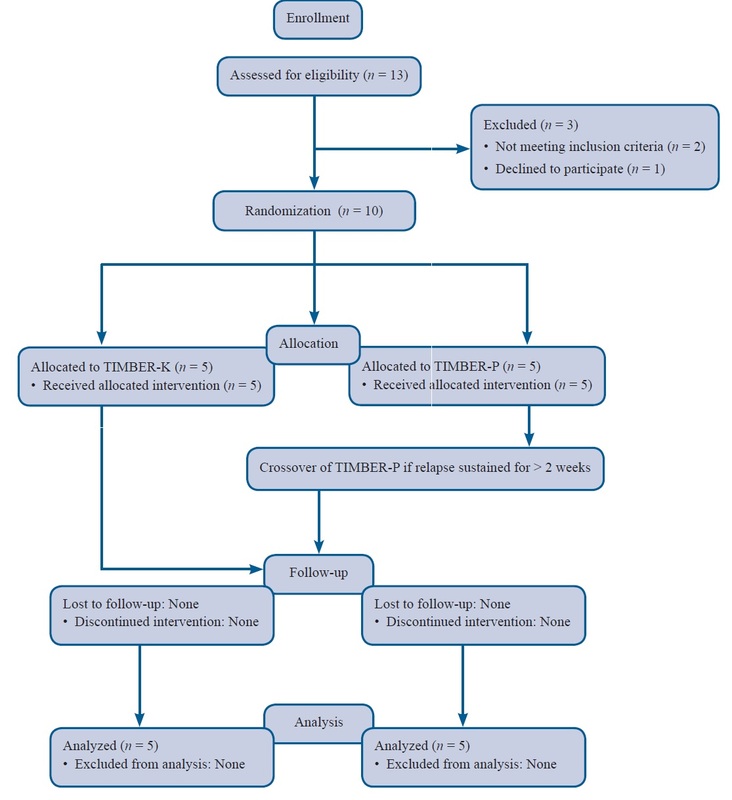 TIMBER induces a mindfulness based detachment and monitoring mental state in the patient (MBDM) (Pradhan, 2015) in which the reactivated TMs and accompanying arousal or cognitive-affective-behavioral expressions are appraised in a neutral/detached manner and modified through CBT by the use of meditation and the five-factor inventory of trauma experience (Pradhan, 2014; Pradhan and Pinninti, 2016). The development of TIMBER raises the possibility of combining psychotherapy with pharmacotherapy to target the TMs in order to ensure rapid and effective treatments. In this study, low dose (R, S)-ketamine was chosen as the medication as many proof of concept studies suggest that (R, S)-ketamine works as a rapid treatment for symptoms of PTSD (Feder et al., 2014) as well as depression, suicidality and anxiety which are often found comorbid (Zarate et al., 2006; Aan Het Rot et al., 2012; Murrough et al., 2013). However, the clinical response produced by (R, S)-ketamine is not long lasting, i.e., the effects of a single infusion last in the range of 4–7 days only (Murrough et al., 2013; Feder et al., 2014). 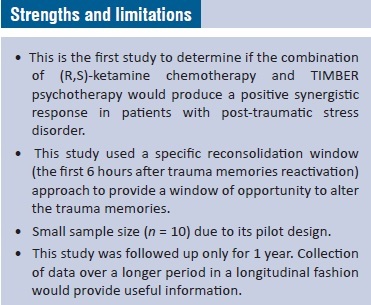 The objective of this pilot study was to determine if the combination of (R, S)-ketamine chemotherapy and TIMBER psychotherapy would produce a positive synergistic response in patients with PTSD. This is a randomized, double-blind, placebo-controlled, cross-over study, which was performed at the Department of Psychiatry and Department of Anesthesiology, Cooper University Hospital and Cooper Medical School of Rowan University, Camden, NJ, USA. In this pilot study, patients in the TIMBER-K group (n = 5) received ketamine (single in-fusion) and TIMBER (12 sessions) whereas those in the TIMBER-P group (n = 5) received placebo (single infu-sion of normal saline) and TIMBER (12 sessions). The 12 TIMBER sessions consisted of 3 sessions in the first week (during infusion, on the 2nd day and on the 8th day) followed by 9 sessions conducted on a weekly basis, 45 minutes duration each. The durations of responses were determined between these two groups. The patients in the TIMBER-P group were switched to the TIMBER-K group treatment after they experienced a sustained relapse for 2 weeks. Recruitment was done over a 2-month period and patients were followed up for 18 months after the initial infusion. The objective was to optimize and individualize treatment of chronic PTSD and to develop a rapid, effective, and less expensive approach. This study was approved by the Cooper University Hospital Institutional Review Board (approval No. 13-078) and this study was performed in accordance with ethical guidelines laid out by the US National Institute of Health and the principles of the Declaration of Helsinki. Written informed consent was obtained from all patients. All patients were refractory for at least 6 months before their recruitment and were tried on treatment as usual, i.e., CBT and at least two antidepressants (SSRIs and SNRIs) with therapeutic adequate dosage and for duration of at least 6 months. Out of 10 patients, seven patients suffered from repeated sexual trauma, two patients from motor vehicle accident and one patient from combat related trauma. The primary investigator enrolled patients and statistician generated the randomization with block technique using 1:1 ratio. All the study personnel except statistician and pharmacist remained blinded. Ten patients with chronic and refractory PTSD were randomly assigned to two groups (n = 5 each): TIMBER-K group received ketamine infusion in combination with 12 TIMBER sessions and TIMBER-P group received combined placebo (normal saline infusion) and 12 TIMBER sessions. The subjects in the TIMBER-P group were switched to the TIMBER-K group treatment after they experienced a sustained relapse. TIMBER has two versions: the longer version (full Timber, 40–45 minutes, extinction of trauma memory format that used mindfulness based graded exposure therapy, MB-GET) and the shorter version (mini-TIMBER/STOPP module, 5 minutes, reconsolidation of calming memory format) (Pradhan and Pinninti, 2016). Mini-TIMBER helps subject to quickly deescalate the arousal response or emotional outbursts in daily life and is suitable in controlled reactivation of TM procedures as done in memory extinction or reconsolidation treatment protocols. In the treatment protocol employed in the current pilot study, we did mini-TIMBER during the 60-minute peri-infusion period (defined as the period consisting of 10 minutes prior to beginning of infusion and 10 minutes after infusion ends: the actual infusion time is 40 minutes). In the peri-infusion period, in addition to the infusion (of ketamine or normal saline), two cycles (each cycle is about 10 minutes) of combined extinction-reconsolidation interventions consisting of controlled arousal and STOPP module/mini-TIMBER are practiced by the subject so that expressions of TMs are extinguished and calming/healthy memories are reconsolidated. Of note, STOPP module of mindfulness to handle frustration, anger, anxiety and impulsivity in daily life situations is the acronym for Stress, Three mindful breaths, Observe, Practice more and Proceed (for details please see Pradhan and Pinninti, 2016). STOPP module is Pradhan's behavioral adaptation of The Middle Way philosophy of mindfulness traditions (Pradhan, 2014) which he has successfully applied in clinical situations with age range of 6–80 years. In the initial 10 minutes of the peri-infusion period, controlled reactivation of TMs is done by asking the subject to reflect on a personalized scripted narrative of index trauma (prepared earlier during initial assessment phase) for 1 minute. Then the ensuing arousal responses are allowed to express by the subject for 2–3 minutes: this step makes the TMs labile and thus prone to change with interventions during the reconsolidation window period which is 6 hours in humans (Monfils et al., 2009). Then infusion is allowed and throughout the infusion period (40 minutes), extinction of TMs and reconsolidation of calming memories is done by two cycles (one cycle takes 10 minutes) of brief and controlled arousals followed by practicing mini-TIMBER/STOPP module for 5 minutes which deescalates the arousal response and establishes the mindfulness based detached monitoring (MBDM) of the TMs in the subject. To avoid retraumatization in the subjects, the arousal responses are kept brief and under control by using the STOPP module to deescalate and also by ongoing monitoring using a specific scale, the Arousal Response during Trauma Memory Reactivation (ART-MR, higher scores indicate higher level of arousal) (Pradhan et al., 2015). Of note, ketamine is known to be a dissociative anesthetic agent and administration of this dose (0.5 mg/kg body weight) augments this MBDM state in the subject by causing a relaxed and dissociated mental state in which subject does not react to the TMs, rather passively accept them as they come. Throughout the peri-infusion period, the arousal response is kept under control (to avoid risk of retraumatization) by keeping the ART-MR scale scores within 30 (scores in this scale range from 0–55). This combined targeted approach integrates the strengths of both mini-TIMBER and ketamine and prevents restoration or reexpression of the TMs and the associated reactivity. On the study day, the subject was admitted into the Cooper University Hospital Department of Anesthesiology's short procedure unit at 7 a.m. The investigational pharmacist provided the blinded solutions to a member of the study team and the subject was prepared for the procedure. For each infusion, an anesthesiologist infused (R, S)-ketamine (240 mL solution containing 0.5 mg/kg body weight dose, supplier is Tocris Bioscience, Boston, MA, USA) or equal volume of normal saline over 40 minutes with standard telemetry monitoring (e.g., pulse oximetry, heart rate, blood pressure, respiration, and temperature) following previously described procedures (Feder et al., 2014). At 240 minutes after the initiation of the infusion, subjects were assessed using PTSD Checklist (PCL) (for PTSD) and Beck Anxiety Inventory (BAI) (for anxiety), at 480 minutes, the assessment included subject's rating on PCL, BAI, the Montreal Cognitive Assessment Scale (MoCA) and the Columbia Suicide Severity Rating Scale (C-SSRS). As per protocol, an attending anesthesiologist was present throughout the infusion and had the option to treat subjects for elevated blood pressure (if > 180/100 mmHg) or tachycardia (if > 110 per minute). This situation never arose in this study. From the second day after the infusion until relapse, all subjects were followed up every week by face to face clin-ical evaluation using rating scales. Until relapse, all subjects practiced at home the mini-TIMBER/STOPP module twice daily (morning and bed time) for 10 minutes each and for 5 minutes as needed to decrease the flash backs and panic symptoms and insomnia. Once relapsed, they were assigned for 9 sessions of full TIMBER therapy conducted at once a week frequency and 40–45-minute duration/session (which as mentioned before promoted the extinction of trauma memory using the mindfulness based graded exposure therapy [MB-GET]). Throughout the duration of the subjects' participation in this study, the dosages of medications were kept constant/unchanged. All subjects had the complete history and physical examination at the initial assessment in the psychiatrist's outpatient office in the Department of Psychiatry at Cooper University Hospital. Subsequently, the following rating scales were administered by the same psychiatrist (BP): (i) PTSD Checklist (PCL) (Weathers et al., 1994), (ii) Clinician Administered PTSD Scale for DSM-IV (CAPS) (Blake et al., 1995), (iii) The 17-item Hamilton Rating Scale for Depression (Ham-D-17), clinician rated) (Bech, 1995), (iv) Beck Anxiety Inventory (BAI) (Beck and Steer, 1993), and (v) Montreal Cognitive Assessment (MoCA) (Nasreddine et al., 2005) at baseline and 8 hours after infusion to examine if ketamine selectively affected TMs leaving the general memory intact. The mindfulness interventions in TIMBER were personalized based on subject's scores on Assessment Scale for Mindfulness Interventions (ASMI: 18-item, scores range 0–90: higher scores represent higher level of mindful-ness) (Pradhan, 2014) which was administered at baseline, and after 5 sessions and 9 sessions (completion) of TIMBER. Also scripted narrative of the index trauma was prepared in a personalized way for each subject. In this study, scores on CAPS and PCL scales were the primary outcome measures, based on which sample size was cal-culated for this pilot study. Responder: For a subject to be identified as a responder, he/she needed to satisfy the following criteria: (i) The 24-hour post-infusion scores on PCL and CAPS decreased by at least 20 points from baseline, and (ii) these reductions needed to be sustained for at least 7 days. Of note, these criteria are more stringent than those used in other studies in which there have been no mention of how long the response needs to be sustained for considering a subject as a responder. 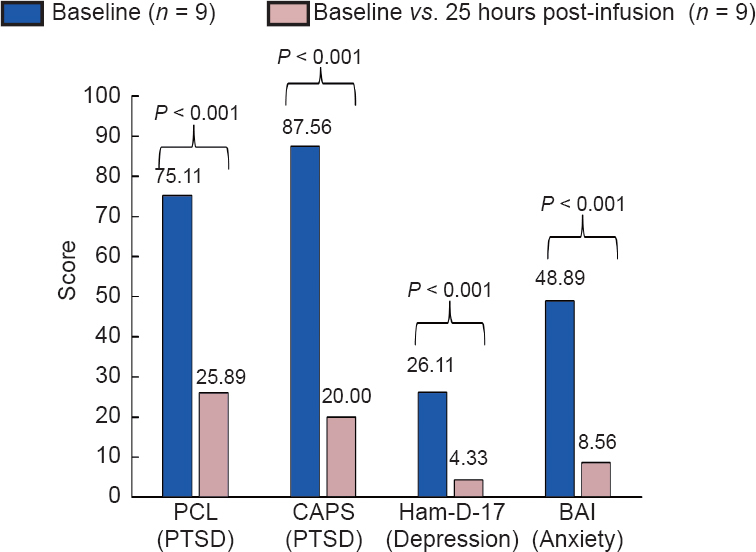 For comorbid depression, a decrease of 50% or more from baseline at 24-hour post-infusion was considered as a response (secondary outcome measure. Ham-D-17 has been used as the “gold standard” instrument to assess the severity of depression and response to therapy in clinical research. Remission: Remission of PTSD was defined as no or minimal PTSD symptoms (total scores of < 30 points in CAPS and < 30 in the self-rated PCL scale) (Monson et al., 2008). On secondary outcome measures, remission of depression was defined as Ham-D-17 scores < 7, and remission of anxiety was defined as BAI scale scores < 7 (Doyle and Pollack, 2003). Relapse: Relapse is defined as total scores of > 50 points in the CAPS and > 51 points in the PCL (Monson et al., 2008). For this study, sample size calculation and power analysis using the mean PTSD scale (CAPS) scores of 92, standard deviation 11 and difference of 20 points in the scores at 24-hour post infusion revealed that for 80% power (2 tailed alpha = 0.05), the number of subjects needed per group is five, so recruitment of 10 subjects was done to be allocated randomly in two groups. All study data were entered into an excel spreadsheet and were verified against the source documents by two members of the study team. For in-between group comparisons, quantitative test score data were analyzed using t-tests. Categorical data were analyzed using the chi-square test. The responses in the TIMBER-K and TIMBER-P groups (in terms of % change in mean scores from baseline in various time frames) were compared using the Z-statistics as well. The Pearson correlation coefficient was used to evaluate the relationship between ASMI scores and duration of the sustained response. Data in the tables are presented as the mean ± SD and P < 0.05 was considered statistically significant. No changes to trial were made after the trial was commenced. Statistical analysis was performed using SPSS 23.0 software (IBM, Armonk, NY, USA). The average age of 10 study subjects (seven females, three males) was 43 ± 13.3 years, with 13 ± 2.75 years of education. [Figure 1] described the study enrollment in CONSORT format. Two subjects were employed and 8 were unemployed. The average duration of PTSD was 19.2 ± 12.51 years and their mean baseline CAPS score was 92 ± 11 indicating severe PTSD. The mean Ham-D-17 score at baseline was 26.9 ± 6.17, indicating severe depression (Ham-D-17 scores over 24 indicate severe depression). As demonstrated in [Table 1],[Table 2],[Table 3] and [Figure 2], the subjects were compared on the sociodemographical parameters (their age, gender, and years of education, etc.) and clinical parameters (duration of PTSD, various scale scores and duration of response). On comparison between TIMBER-K and TIMBER-P arms, there was no statistical difference with respect to age (37.20 ± 12.44 years vs. 48.80 ± 5.07 years, P = 0.09); years of education (12.00 ± 2.12 years vs. 14.00 ± 3.16 years, P = 0.27) and duration of PTSD (16.20 ± 12.01 vs. 22.20 ± 13.61 years, P = 0.48). However, subjects in these two groups differed on gender (all five subjects in TIMBER-K arm were females whereas TIMBER-P arm had three males and two females, P = 0.038). In other words, except for gender, subjects were matched on sociodemographic parameters and randomization was successful. As evident from the PTSD, depression and anxiety scores shown in [Table 1] and [Figure 2], nine out of the 10 subjects (five/five in TIMBER-K group and four out of the five in TIMBER-P group) met all the response criteria and were identified as responders. There was no dropout, results of all nine subjects were analyzed (intention to treat analysis) and the duration of response for the nine subjects was considerably sustained (31.78 ± 18.29 days) as compared to usual 4–7 days of response seen with single infusion of (R, S)-ketamine only (Feder et al., 2014). Figure 2 Baseline versus post-intervention scores at various time frames in 10 subjects. Note: PTSD: post-traumatic stress disorder; PCL: PTSD Checklist; CAPS: Clinician Administered PTSD Scale for DSM-IV; Ham-D-17: 17-item Hamilton Rating Scale for Depression; BAI: Beck Anxiety Inventory. Nine out of 10 subjects were depicted in [Figure 3]. Figure 3: Baseline versus post-intervention scores at various time frames in 9 responder subjects. With respect to the primary outcome measures (CAPS and PCL scores), for the nine subjects who responded, there was significant difference in the PCL scores (P = 0.003) between baseline (mean 75.11 ± 8.28) and 4 hours after infusion (mean 45.67 ± 19.55), the PCL scores between baseline (75.11 ± 8.28) vs. 24 hours after infusion (25.89 ± 6.01) (P < 0.001) and in CAPS scores between baseline (87.56 ± 8.08) and 24 hours after infusion (20.00 ± 7.73) (P < 0.001). 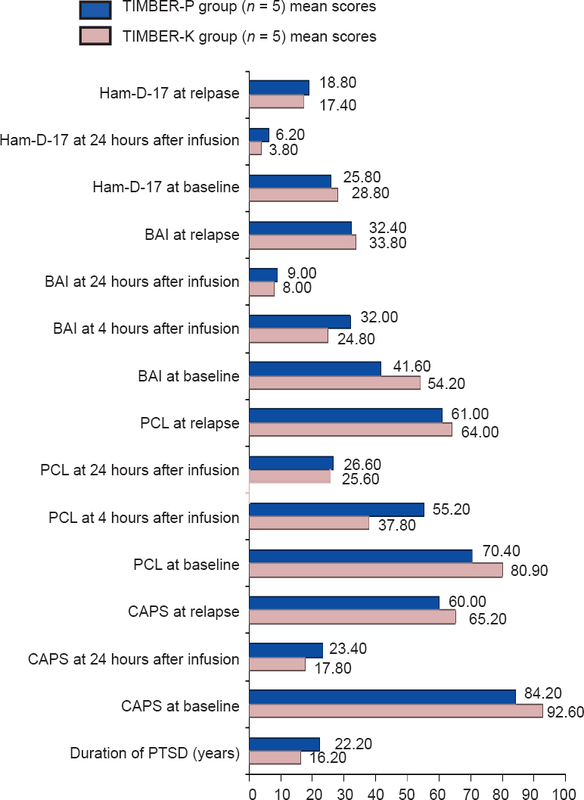 There was significant difference (P < 0.001) in Ham-D-17 scores between baseline (26.11 ± 5.9) and 24 hours after infusion (4.33 ± 2.55), in BAI scores between baseline (48.89 ± 12.49) and at the 5th hour (27.67 ± 15.31) (P < 0.005), and in BAI scores between baseline (48.89 ± 12.49) vs. 24 hours after infusion (8.56 ± 4.67) (P < 0.001). All subjects were actively participating in home practice of TIMBER (twice daily in the routine practice mode and 3–5 times in the as needed practice mode). More details are available in [Table 2] and [Figure 4]. [Table 2] also includes some of the basic demographic information. Analysis was completed as per protocol and no changes were made during or after trial completion. Figure 4 Subject's response in TIMBER-K versus TIMBER-P arms at various time frames after initial infusion. Note: TIMBER-K group received combined ketamine infusion and 12 TIMBER sessions and TIMBER-P group received combined placebo (normal saline infusion) and 12 TIMBER sessions. TIMBER: Trauma Interventions using Mindfulness Based Extinction and Reconsolidation; Ham-D-17: 17-item Hamilton Rating Scale for Depression; BAI: Beck Anxiety Inventory; PCL: PTSD Checklist; CAPS: Clinician Administered PTSD Scale for DSM-IV; PTSD: post-traumatic stress disorder. Subjects in the TIMBER-K group had a more robust and sustained response (33 ± 22.98 days) as compared to those in the TIMBER-P group (25 ± 16.8 days) but this difference was not significant (P = 0.545). There was no significant difference between TIMBER-K and TIMBER-P arms in terms of % change in mean scores from baseline in various time frames and their scores on the Z-statistics ([Table 3]). There was significant increase in subjects' (n = 10) ASMI scores (which reflect their level of mindfulness) after five sessions of TIMBER psychotherapy (72.80 ± 8.74 vs. 50.80 ± 8.87, P = 0.043) and ASMI scores at baseline were positively, but not significantly, correlated with the duration of sustained response (r = 0.53, P = 0.115). According to the study protocol, all 5 subjects in TIMBER-P arm were switched to TIMBER-K arm after they had a sustained relapse defined as CAPS scores > 50 points and PCL > 51 points, which persisted for at least 7 days. In these subjects, the administration of (R, S)-ketamine significantly prolonged the mean duration of response by 24 days from 25 ± 16.58 days to 49 ± 18.4 days (P = 0.028). No clinically significant side effects were observed, including cognitive side effects; however, two subjects ex-perienced mild nausea within 1-hour post-infusion which resolved without needing medical interventions. During the 18-month follow-up in the outpatient department, no subjects had suicidal behavior, dropped out, or required psychiatric hospitalization. As detailed in the results section, this pilot study showed that TIMBER psychotherapy augmented with low dose (R, S)-ketamine (0.5 mg/kg body weight, intravenous infusion) prolonged the therapeutic effects of the later and may be a valuable treatment option for PTSD. To the best of our knowledge, this is the first study that attempts a combined approach using (R, S)-ketamine and mindfulness based cognitive therapy to sustain the therapeutic effects of the former. The combined TIMBER and (R, S)-ketamine therapy increased the duration of the sustained response, which became more sustained after crossover (mean increase was 24 days after crossover). Of note, the usual duration of response after single infusion of (R, S)-ketamine is 4–7 days in PTSD (Feder et al., 2014). The high remission and retention rates in this study indicate the feasibility and subject acceptability of the combined intervention in addition to supporting the efficacy for PTSD with comorbid depression and anxiety symptoms. This study used a specific reconsolidation window (the first 6 hours after TMs reactivation) approach (Monfils et al., 2009; Schiller et al., 2010). This provides a window of opportunity to alter the TM because during this interval, memory stays labile and thus prone to change with interventions. TM consolidation is a glutamate dependent process. We hypothesize that the administration of (R, S)-ketamine modulates the glutamate system directly or via its active metabolite (2S,6S;2R,6R)-hydroxynorketamine (Zanos et al., 2016) and that when it is combined with the use of mini-TIMBER in the reconsolidation window period, the two therapies potentiated each other. Subsequent daily home practice sessions of TIMBER reinforce these therapeutic effects, which may explain why the therapeutic response in our sample has become so robust and sustained. Subject's practice of many cycles of TIMBER in the reconsolidation window during the peri-infusion period as well as during home practice using the format of combined extinction and reconsolidation approaches subjects made their trauma memories labile and prone to change by extinction whereas the quick control of the arousal and establishment of calmness in the reconsolidation window helped reconsolidate the calming memories. Ketamine potentiated this process which explains why subjects in the TIMBER-K arm had more robust response than those in the TIMBER-P arm. Therapeutic use of the reconsolidation window approach also explains why subjects in the TIMBER-K arm had sustained response compared to usual short duration of response (4–7 days) seen in other studies with use of single infusion of ketamine. Although the neural circuitry that TIMBER interventions may influence are yet to be probed by functional neuroimaging protocols, based on the existing research into the pathways involved in PTSD (Shin and Liberzon, 2010; Schiller et al., 2013; Siegelbaum et al., 2013), we postulate that it may involve the fronto-thalamic tricircuits and the working connections between the amygdala and the prefrontal cortex. These are the major hubs involved in the complex communication network that processes the TM and regulates their expressions in context-dependent manner. Perhaps influencing these TM circuits in combination with controlled exposure to the TM stimuli, reappraising them in neutral/detached way using mindfulness based detached monitoring (MBDM) on daily basis and decreasing their inherent threat value via mindfulness based graded exposure therapy, as done in TIM-BER, work together to induce new learning and healthy memories that alter expression of TM in these subjects. Induction of new learning and healthy memories and alteration of enduring TM is of crucial importance for treatment of PTSD. The administration of (R, S)-ketamine has been shown to enhance synaptogenesis and synaptic plasticity in rat brain (Cain et al., 2012) which are the primary mechanisms underlying new learning and formation of new memories. It has also been suggested that this long-term memory is dependent on mammalian target of rapamycin (mTOR) biochemical pathway which the administration of (R, S)-ketamine and (2S,6S)-hydroxynorketamine is known to influence (Cain et al., 2012; Paul et al., 2014). In chronic PTSD, the pathological TM remains as the major reason for prolonged symptoms and treatment resistance (Cain et al., 2012; Duman et al., 2012). Combination of psychotherapy and (R, S)-ketamine administration for targeting TM is an example of a novel strategy to bring possible long-term relief and has potential for curing PTSD. Interestingly, there are suggestions that serum D-serine level and m-TOR signaling could be biomarkers for its therapeutic effects, especially in depression (Hashimoto, 2014; Moaddel et al., 2015). Our study had several important limitations including its small sample size due to its pilot design. The study has one year follow-up but collection of data over even longer period in a longitudinal fashion would also provide useful information. At this time, we are examining the finding of this pilot study in a larger trial to assess if these results replicate there as well. In future, we intend to recruit a group that received (R, S)-ketamine only without TIMBER. Also it will be quite informative to study the effects of this protocol on the various regions of interest in participant's brain using neuroimaging tools. Aan Het Rot M, Zarate CA Jr, Charney DS, Mathew SJ (2012) Ketamine for depression: where do we go from here? Biol Psy-chiatry 72:537-547. Bech P (1995) The bech, hamilton, and zung scales for mood disorders: Screening and listening: A twenty years update with reference to DSM-IV and ICD-10. Springer. Beck A, Steer RA (1993) Beck Anxiety Inventory Manual. San Antonio, TX: The Psychological Corporation. Blake DD, Weathers FW, Nagy LM, Kaloupek DG, Gusman FD, Charney DS, Keane TM (1995) The development of a Clinician-Administered PTSD Scale. J Trauma Stress 8:75-90. Cain CK, Maynard GD, Kehne JH (2012) Targeting memory processes with drugs to prevent or cure PTSD. Expert Opin Investig Drugs 21:1323-1350. Cukor J, Spitalnick J, Difede J, Rizzo A, Rothbaum BO (2009) Emerging treatments for PTSD. Clin Psychol Rev 29:715-726. Debiec J, Ledoux JE (2004) Disruption of reconsolidation but not consolidation of auditory fear conditioning by noradrenergic blockade in the amygdala. Neuroscience 129:267-272. Doyle AC, Pollack MH (2003) Establishment of remission criteria for anxiety disorders. J Clin Psychiatry 64 Suppl 15:40-5. Duman RS, Li N, Liu RJ, Duric V, Aghajanian G (2012) Signaling pathways underlying the rapid antidepressant actions of ketamine. Neuropharmacology 62:35-41. Feder A, Parides MK, Murrough JW, Perez AM, Morgan JE, Saxena S, Kirkwood K, Aan Het Rot M, Lapidus KA, Wan LB, Iosifescu D, Charney DS (2014) Efficacy of intravenous ketamine for treatment of chronic posttraumatic stress disorder: a randomized clinical trial. JAMA Psychiatry 71:681-688. Gamache K, Pitman RK, Nader K (2012) Preclinical evaluation of reconsolidation blockade by clonidine as a potential novel treatment for posttraumatic stress disorder. Neuropsychopharmacology 37:2789-2796. Hashimoto K (2014) Blood D-serine levels as a predictive biomarker for the rapid antidepressant effects of the NMDA recep-tor antagonist ketamine. Psychopharmacology (Berl) 231:4081-4082. Hoge CW, Grossman SH, Auchterlonie JL, Riviere LA, Milliken CS, Wilk JE (2014) PTSD treatment for soldiers after combat deployment: low utilization of mental health care and reasons for dropout. Psychiatr Serv 65:997-1004. Hupbach A, Gomez R, Hardt O, Nadel L (2007) Reconsolidation of episodic memories: a subtle reminder triggers integration of new information. Learn Mem 14(1-2):47-53. Kessler RC, Chiu WT, Demler O, Merikangas KR, Walters EE (2005) Prevalence, severity, and comorbidity of 12-month DSM-IV disorders in the National Comorbidity Survey Replication. Arch Gen Psychiatry 62:617-627. MacCluskie KC (1998) A review of eye movement desensitization and reprocessing (EMDR): Research findings and implications for counsellors. Can J Couns 32:116-137. Moaddel R, Luckenbaugh DA, Xie Y, Villaseñor A, Brutsche NE, Machado-Vieira R, Ramamoorthy A, Lorenzo MP, Garcia A, Bernier M, Torjman MC, Barbas C, Zarate CA Jr, Wainer IW (2015) D-serine plasma concentration is a potential biomarker of (R, S)-ketamine antidepressant response in subjects with treatment-resistant depression. Psychopharmacology (Berl) 232:399-409. Monfils MH, Cowansage KK, Klann E, LeDoux JE (2009) Extinction-reconsolidation boundaries: key to persistent attenuation of fear memories. Science 324:951-955. Monson CM, Gradus JL, Young-Xu Y, Schnurr PP, Price JL, Schumm JA (2008) Change in posttraumatic stress disorder symptoms: do clinicians and patients agree? Psychol Assess 20:131-138. Murrough JW, Iosifescu DV, Chang LC, Al Jurdi RK, Green CE, Perez AM, Iqbal S, Pillemer S, Foulkes A, Shah A, Charney DS, Mathew SJ (2013) Antidepressant efficacy of ketamine in treatment-resistant major depression: a two-site randomized controlled trial. Am J Psychiatry 170:1134-1142. Nader K, Schafe GE, Le Doux JE (2000) Fear memories require protein synthesis in the amygdala for reconsolidation after retrieval. Nature 406:722-726. Nasreddine ZS, Phillips NA, Bédirian V, Charbonneau S, Whitehead V, Collin I, Cummings JL, Chertkow H (2005) The Mon-treal Cognitive Assessment, MoCA: a brief screening tool for mild cognitive impairment. J Am Geriatr Soc 53:695-699. Paul RK, Singh NS, Khadeer M, Moaddel R, Sanghvi M, Green CE, O'Loughlin K, Torjman MC, Bernier M, Wainer IW (2014) (R, S)-Ketamine metabolites (R, S)-norketamine and (2S,6S)-hydroxynorketamine increase the mammalian target of rapamycin (mTOR) function. Anesthesiology 121:149-159. Pitman RK, Sanders KM, Zusman RM, Healy AR, Cheema F, Lasko NB, Cahill L, Orr SP (2002) Pilot study of secondary prevention of posttraumatic stress disorder with propranolol. Biol Psychiatry 51:189-192. Pradhan B (2014) Yoga and mindfulness based cognitive therapy: A clinical guide. Springer. Pradhan B (2015) Depression specific Yoga and mindfulness based cognitive therapy (DepS Y-MBCT) model: Description, data on efficacy and differences from contemporary models. In: Integrative therapies for depression: Redefining models for assessment, treatment and prevention (Greenblatt J, Brogan K, eds), pp369-377. CRC Press. Pradhan B, Gray R, Parikh T, Akkireddi P, Pumariega A (2015) Trauma interventions using mindfulness based extinction and reconsolidation (TIMBER©) as monotherapy for chronic PTSD: A pilot study. Adolesc Psychiatry 5:125-131. Pradhan B, Kluewer D'Amico J, Makani R, Parikh T (2016) Nonconventional interventions for chronic post-traumatic stress disorder: Ketamine, repetitive transcranial magnetic stimulation (rTMS), and alternative approaches. J Trauma Dissociation 17:35-54. Pradhan BK, Pinninti NR (2016) Chapter-5. Yoga & mindfulness based cognitive therapy for psychosis (Y-MBCTp): A pilot study on its efficacy as brief therapy. In: Brief Interventions for psychosis: A Clinical Compendium (Pradhan B, Pinninti N, Rathod S, eds). Springer Publishers, Switzerland. Schiller D, Kanen JW, LeDoux JE, Monfils MH, Phelps EA (2013) Extinction during reconsolidation of threat memory di-minishes prefrontal cortex involvement. Proc Natl Acad Sci U S A 110:20040-20045. Schiller D, Monfils MH, Raio CM, Johnson DC, Ledoux JE, Phelps EA (2010) Preventing the return of fear in humans using reconsolidation update mechanisms. Nature 463:49-53. Shapiro F (1999) Eye Movement Desensitization and Reprocessing (EMDR) and the anxiety disorders: clinical and research implications of an integrated psychotherapy treatment. J Anxiety Disord 13(1-2):35-67. Shin LM, Liberzon I (2010) The neurocircuitry of fear, stress, and anxiety disorders. Neuropsychopharmacology 35:169-191. Siegelbaum S, Kandel E, Kandel E (2013) Prefrontal cortex, hippocampus, and the biology of explicit memory storage. Princi-ples of Neural Science. 5th ed. New York, Chicago, San-Francisco: McGraw-Hill Companies, Inc.
Soeter M, Kindt M (2010) Dissociating response systems: erasing fear from memory. Neurobiol Learn Mem 94:30-41. Stein DJ, Ipser JC, Seedat S (2006) Pharmacotherapy for post traumatic stress disorder (PTSD). Cochrane Database Syst Rev (1):CD002795. Weathers F, Litz B, Herman D, Huska J, Keane T (1994) The PTSD checklist-civilian version (PCL-C). Boston, MA: National Center for PTSD. Westbrook RF, Iordanova M, McNally G, Richardson R, Harris JA (2002) Reinstatement of fear to an extinguished condi-tioned stimulus: two roles for context. J Exp Psychol Anim Behav Process 28:97-110. Zanos P, Moaddel R, Morris PJ, Georgiou P, Fischell J, Elmer GI, Alkondon M, Yuan P, Pribut HJ, Singh NS, Dossou KS, Fang Y, Huang XP, Mayo CL, Wainer IW, Albuquerque EX, Thompson SM, Thomas CJ, Zarate CA Jr, Gould TD (2016) NMDAR inhibition-independent antidepressant actions of ketamine metabolites. Nature 533:481-486. Zarate CA Jr, Singh JB, Carlson PJ, Brutsche NE, Ameli R, Luckenbaugh DA, Charney DS, Manji HK (2006) A randomized trial of an N-methyl-D-aspartate antagonist in treatment-resistant major depression. Arch Gen Psychiatry 63:856-864. BKP and MCT were responsible for study design. BKP was in charge of interventions. IWW and RM performed biomarker and metabolomics assays. MG, MS and AJP recruited the subjects. MCT and TP were responsible for statistical analysis. All authors participated in the manuscript preparation and approved the final version of this paper. None of the authors have any financial interests to disclose. This study was approved by the Cooper University Hospital Institutional Review Board (approval No. 13-078) and this study was performed in accordance with ethical guidelines laid out by the US National Institute of Health and the principles of the Declaration of Helsinki. Written informed consent was obtained from all subjects. The authors certify that they will obtain all appropriate patient consent forms. In the form, the patients will give their consent for their images and other clinical information to be reported in the journal. The patients understand that their names and initials will not be published and due efforts will be made to conceal their identity, but anonymity cannot be guaranteed. The datasets analyzed during the current study are available from the corre-sponding author on reasonable request.